The GVXO-25 is supplied in bulk. 25pcs per tube is the standard pack size for this product. Orders for other quantities will receive either partial tubes or tray-packed products. The GVXO-25 is no longer recommended for new designs, please consider the GVXO-41F for a more cost effective option for standard applications. The GVXO-25 offers the engineer low phase noise characteristics, in addition to frequency pullability of ±200ppm, with CMOS/TTL compatible output. Thanks to its integral fundamental mode crystal, coupled with a low noise internal oscillator, the GVXO-25 is able to offer very good low phase noise characteristics. 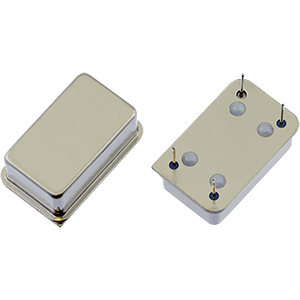 In addition this component can be configured with various frequency stability and frequency pullability options. The GVXO-25 also has a robust industry-standard 14 pin DIL package. To request a quotation for the GVXO-25 please use the configurable options form to choose the options you require and then submit your configured product to our team. Our expert advisers are always happy to help with your requirements and can be contacted on +44 1460 256 100 or at sales@golledge.com.